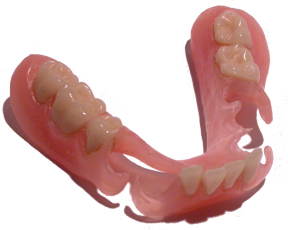 Often referred to as "Valplast®" partials, flexible partial dentures were first introduced in the early 1950s. New materials and fabrication methods have been developed and improved upon, resulting in greater opportunities and choices for the dentist, patient, and dental laboratory. Pickett Dental Laboratory is pleased to offer FlexStar V Flexible Partial Dentures. FlexStar thermoplastic nylon resin, a product of CMP Industries, is biocompatible and carries the highest rating, Class VI, from the US Pharmacopeia (USP). FlexStar partial dentures are stain and odor resistant, thin and lightweight, yet strong and virtually unbreakable. A flexible partial denture may be an optimal choice whenever metal-free partials are indicated, or for patients who prefer not to use a cast metal framework or fixed restoration. In addition, a FlexStar partial denture may be an ideal option for patients with sensitvities or allergies to methyl methacrylate-based acrylics, or when the protuberant bony formations restrict the insertion of an acrylic denture. Although a flexible partial denture may be an acceptable clinical and aesthetic alternative in many dental restorative applications, it is not without limitations or disadvantages. It should not be considered a universally appropriate alternative to a traditionial cast metal partial, rigid acrylic partial, or fixed restoration. FlexStar partial dentures in some instances can be added to or relined, but Pickett Dental Laboratory does not recommend that a flexible partial denture be used as a transitional appliance or if future extractions are anticipated. As well, the dentist should consider the possible anatomical consequences of a dental appliance, such as a flexible partial denture, that is tissue borne vs tooth-borne. 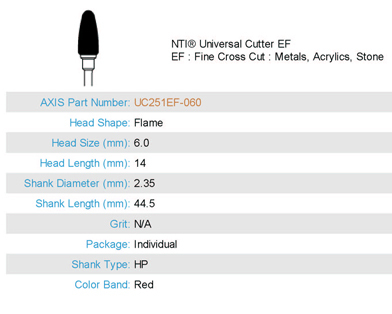 FlexStar partial denture material can be used to fabricate flexible retention clasps on traditional metal partials. The nylon-based material used in the fabrication of FlexStar partial dentures results in a virtually unbreakable dental appliance. A bur used for chairside adjustments of standard acrylic dentures may not work effectively or efficiently on flexible partial denture nylon-based material. The bur shown on the right is an example of the type of bur we recommend to dental offices for chairside adjustments of FlexStar flexible partial dentures. Please visit Pickett Dental Laboratory's Online Forms page for information about the forms and documents that you may download. These include lab slips, fee schedules, information about Pickett Dental Laboratory's discount program, and manufacturer product brochures. All trademarks and logos are acknowledged as property of their respective owners.